Our legal team can check your documents once you have edited them. 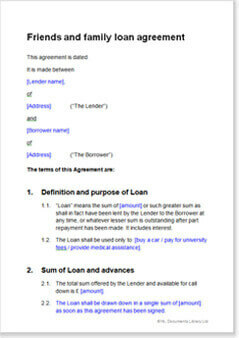 Most legal document templates you find on the Internet will give you the minimum wording required to achieve the task. In contrast, our documents contain far more options and consider far more points than even most solicitors would offer. We combine deep knowledge of the law with practical, real world experience and understanding of the commercial elements of any deal. So we give you legal documents that should not only protect you, but that should also give you commercial and legal advantage. We have always used plain English because it makes documents easier to understand and less likely to be disputed. It also makes editing easier. But we go further than that by also structuring our documents in a way that also makes editing easy. For example, we don’t cross reference paragraphs. We also include guidance notes to help you edit each paragraph precisely to your own requirements. Of course, these include practical points as well as legal ones. Our documents are drawn to be completed without further professional help. You do not need to instruct a solicitor unless the subject matter goes beyond what is in the document. All our documents are covered by our money back guarantee. If for any reason you want to return your document, we’ll refund you in full, immediately, and without question. We want you to be confident that you have the best document, not simply one that “will do”. © 2000 - 2019 Net Lawman Limited. All rights reserved.